The Iron Mountain Metal Craft Shop is located in Old Mill Square next to The Old Mill in Pigeon Forge. 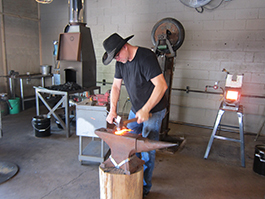 Owner and blacksmith Robby Bowman is a third generation blacksmith. 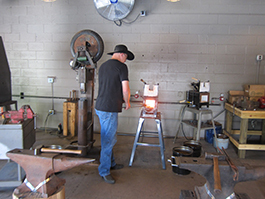 Bowman demonstrates his skills as visitors watch -- he heats, molds, and bends metal into shapes of knives and other objects. 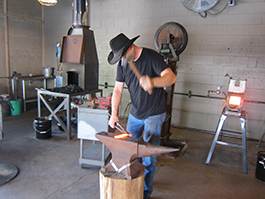 For a fee, you can put on the apron, gloves, and protective glasses and take a class in blacksmithing. Learn to make a knife that you can keep as a souvenir. Inside the show room are numerous knives and ornaments of all shapes and sizes for sale, a created by Bowman. Some of his more unique handle designs are made from shells from 20mm and 50 mm guns. The shells are from the World War II and Vietnam era and are supplied to Bowman by a Vietnam War veteran. 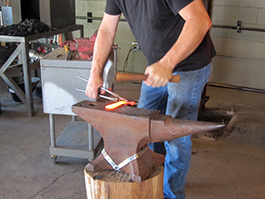 Blacksmithing is not only a part of Bowman’s roots, it is also part of Sevier County’s local heritage. 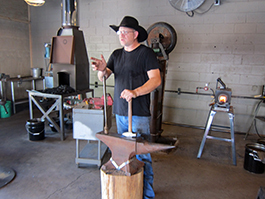 The city of Pigeon Forge has a logo that features a blacksmith. During the early 1800s numerous blacksmiths and furnaces aligned the Pigeon River where they maintained places of business. From these forges located on the Pigeon River came the town’s name of Pigeon Forge. 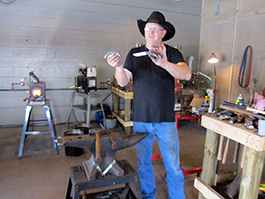 Iron Mountain Metal Craft is the only blacksmith in Pigeon Forge outside of Dollywood. The blacksmith at Dollywood doesn’t allow guests to work with the tools or make their own crafts. To learn more about Iron Mountain Metal Craft call 423-782-6784. © 1997-2018 by Image Builders. All rights reserved.